That's right, I finished! 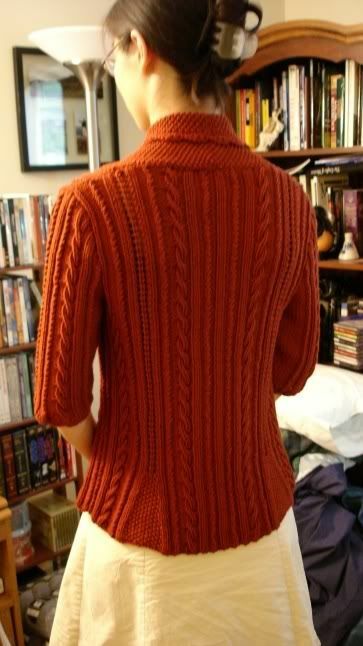 I really enjoyed knitting this sweater. I was dubious about making a wool sweater with elbow-length sleeves, but after wearing it around for a bit, I've decided I like that feature. Overall, it was an enjoyable project that produced an end result I am happy with. However, I am still unsure about the yarn, Berroco Pure Merino. It's very soft, but it stretches a lot. I will have to be very careful when I wash this sweater. 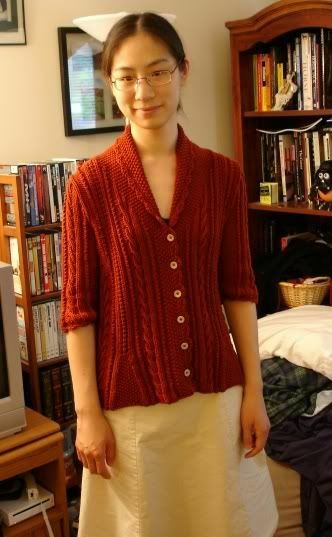 Modifications to the pattern: After knitting the waist decreases as written, I knit for 2 extra inches before I did the bust increases. For the sleeves, I knit the sleeves for the next size up, to avoid them being too tight (however, I don't think this mod was necessary, since the yarn I used is so stretchy). When I crocheted the scallops on the sleeves, I did it with the RS facing and worked in rounds, instead of starting with the WS facing and turning after the first row. For the crochet on the button bands, I did the sc row in one hook size, then I went up two hook sizes for the scallop row. I also did the scallops as *sc, skip 1 st, dc/ch 1/dc/ch1/dc all in next st, skip 1 st* instead of *sc, skip 2 sts, dc/ch 1/dc/ch1/dc all in next st, skip 2 sts*. I found that this made the scallops stand out a bit better. Finally, I worked six buttonholes instead of five.